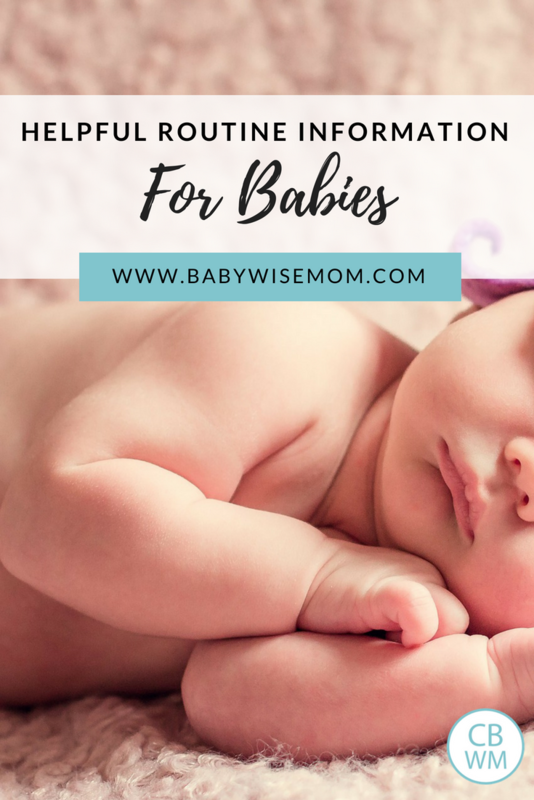 Helpful Routine Information for a Great Baby Routine. Get your Babywise baby on a great schedule. It is always helpful to see what people do to help get great sleep and routines for their babies. Here are some guidelines followed by Babywise moms. There are some discrepancies between the chart and the book, so I have noted those differences. You can always tweak things as needed if what is listed in the book isn’t ideal for your baby. Remember, your schedule is here to serve you. (If it were me, I would have 2.5 time intervals in the day so there are at most 2 night feedings…I consider 10 pm to be night feeding). Sleeping through the night!!!! The goal! (STTN means Baby can gradually move to 9-10 hours of continuous sleep if breastfed, 11 hours if bottlefed. I will also add, you don’t want to extend your routine until baby is sleeping through the night. You also don’t want to extend it until that dreamfeed is dropped, so that 11:30 feeding would be gone before you dropped daytime feedings. You want long, continuous sleep at night for optimal development. So, if this were me, I would have a 7:30 feeding right before bed. I also wouldn’t have that 9 and 11:30 feedings. If baby needed an extra feeding, I would shorten the daytime schedule back to three hours to work the right number of feedings in). Should you wake up a sleeping child? Previous Post What Age Did You Drop the Swaddle Completely? Next Post Is Baby’s Night Waking from Hunger? I am hoping you can help me. My baby girl is 8 weeks old, and we have been trying to implement Babywise principles with her. She is on a eat/wake/sleep cycle, and we finally have the eating part down (I had many difficulties with breastfeeding). She is basically on a 3 hour schedule during the day. We feed her between 10:30 and 11:00 at night, and sometimes she will wake for two feedings in the middle of the night (about 2:30 and 5:30), and sometimes we get way with only one (about 3:30 and then again at about 7:00). Her wake times are happy and she seems to have the ability to stay awake for a pretty good amount of time. In general, I try and put her down for a nap about 1 1/2 hours before her next feeding time. Sometimes she signals tiredness earlier, and sometimes she falls asleep while doing an activity like taking a walk in the stroller. We have not been great about putting her down without trying to “help” her go to sleep. During the night (any sleep time between 8:00 p.m. and 8:00 a.m. basically), however, we do put her down and she goes right to sleep without help. My problem right now is with naps. I have been working on putting her down while she is still awake and allowing her to cry. Well, for the last two days, she has cried on and off for as long as an hour and a half at nap times. Tonight, she cried for a full nap time. Obviously, we checked on her several times, tried to sooth her and comfort her, but she never fell asleep. How long do we let her cry? I even tried putting her down 15 minutes earlier, following the advice about overstimulation. I almost lost my mind. The other thing we struggle with is her waking early from a nap once she finally settles down. Sometimes I think this has to do with gas, but regardless it is troublesome. I am feeling pretty discouraged, and I am not sure what to do about this. I am hoping you can help me. I want to stick with this–all other aspects are working beautifully, we just can’t seem to get this nap thing together, and I am afraid this is hindering the process of her sleeping through the night as well. Any suggestions? My son is 15 weeks now but is not sleeping through the night yet. He is on a 3 hour schedule(7,10,1,4,7,12,4). Just recently, he started eating much less from the breast. So I pumped and fed him from the bottle to confirm. He is eating significantly less. I’m figuring that he does not need to eat as often and that I need to stretch time between his feedings. However, you suggest that one should not stretch the time until the baby is STTN which my baby is not. Also, he’s nap time and wake time has not extended. So how should I adjust his schedule so that he is not snacking. I feel like he can go 4 hours between eating but I don’t think he can stay awake and sleep that long. What do you think? Btw,thank you so much for this blog! It’s provided me with so much support during tough times. My son is 10 weeks old and is still not sleeping through the night. I am feeding every 3 hours during the day. He is able to stay awake for about 1 hour and 15 minutes each wake period. He naps great during the day. His last feeding (dream feed) is at 10pm. Then he usually wakes up sometime between 3:30 and 4:30. He has made it to 5am but only 3 times. For the past 4 nights, I have fed him only 5 minutes on each side to try to wean him. I’m afraid to decrease my times any further because I think he is truely hungry. Is there anything that I should do to try to get him to sleep until 7am? Or, should I just be patient and let him do it on his own? Any adviced would be appreciated. Thanks! KCH,For starting the day later, I would just wait to start him by 5-15 minutes each day. Hopefully he will get used to eating later and sleep later. Before you feed solids, try nursing one side, feeding solids, then nursing the other side. Judy,You can stretch feeding times if it doesn’t cause you to drop a feeding. So you can do a combo schedule of 3-3.5 hours. Of course, you can drop a day feeding if you want to, but it will most likely only prolong the time until that night feeding is dropped.If you move to a four hour before he can sleep until feeding time, you are only going to cause more stress for yourself. Try the combo schedule first. A few moms found things clicked better after extending the schedule. You can always try it and see what happens, then go back if he isn’t ready. Good luck! Thanks for your response. I definitely do think he’s ready for a combo 3.0/3.5 but I’m still unsure how to extend to 3.5 hours. So if he has waketime for 1 1/2 hours and naps for 1 or 1 1/2 hours and I extend his schedule to 3.5 hours, what do I do with the leftover 30 minutes to 1 hour after he wakes up from his nap? I’m afraid that will mess up the eat/wake/nap pattern. It will look more like eat/wake/nap/wake, no? My daughter is approaching 8 months and really isn’t on a 4-hour schedule YET. She has had trouble gaining weight, so I’ve wanted to keep 5 feedings for a little while longer. But looking ahead to the 4-hour schedule, if we begin at 7am, our last feeding has to end at 7pm? She has never been a 12 hour sleeper so I usually put her down at 8pm. How would this work? Sorry…one more thing. I’m assuming that the eat/wake/sleep cycle is a little different when moving to this 4-hour schedule with only two naps. Is this correct? Do the morning naps remain at the same time when the 3rd nap is dropped, or do they adjust a little? Heather,For my daughter, the whole last feeding plus getting ready for bed usually lasts about 45 minutes. So if you were to feed her and then get her ready for bed and do your routine, you could get her closer to 8 PM. Also, you could start the last feeding a little later than 7 if she will do it.It is a bit different with two naps, but not really. Here is our schedule:7:30 wake up and eat breakfast9:30 nap11:30 wake up and eat lunch1:30 nap3:45 wake up and drink some milk5:30 dinner with family7:00 last liquid feeding of the dayKaitlyn is 13 months. So without that third nap, you do have a period of no sleep betweeen eating. You can have only 3 liquid feedings at this age also, but she won’t drink enough milk in three most days. Also, that milk is a nice thing to hold her over until dinner time. I’m really confused about what kind of schedule my 4 month old should be on and i was hoping you could help…I was reading the 4-5 month old sample schedule and I’m not sure how to implement a few things. First- how do you transition from a 3 hour schedule to 3.5 or 4 hours?also, how do you drop the dream feed? his schedule has been 7am, 10, 1, 4, 7pm, and then i dreamfeed at around 10:30…do i just not feed him? in the past I have tried this and he would wake me up at 1am crying to eat (he is STTN, has been for a month or so) Am i supposed to let him cry at 1am back to sleep?When I feed him at 7 I don’t put him right back to bed like the schedule suggests, i usually have a little awake time, a bath, and then he goes to bed. is this wrong? For the past week he has not been sleeping well, is it typical to have trouble at 4mos with sleeping? I was wondering to if you thought maybe the trouble with sleeping was b/c it is time for less naps, maybe he’s not tired?Thank you so much for your advice!!! i love this website so much. thank you Valerie,I will monitor her behaviour with regards to the naps and see if the waketime requires shortening or lengthening. Now I have something to look for that is a little more concrete…thank you! I noticed that during the earlier months on the suggested schedule it suggests giving baby awake time after the early night feeding (7:00ish) but none after the late night feeding. Then slowly the bed time without an awake period becomes earlier as the baby gets older. 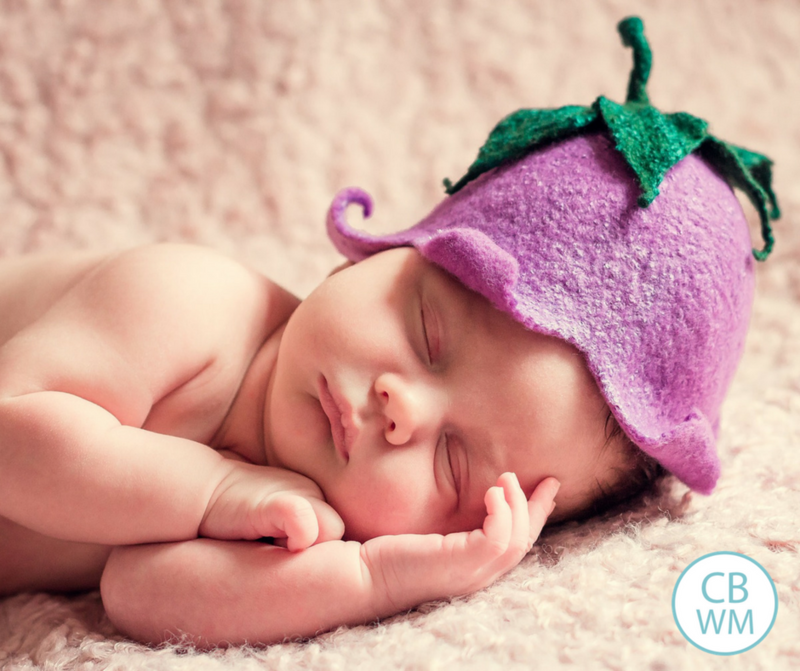 It sounds like you suggest always having an earlier bedtime without an awake period, but I have heard that sometimes younger babies have a hard time sleeping for an extended period of time (even with their feeding needs taken care of). Do you, or anyone else, know much about this? It seems like putting a baby to bed earlier when they are really young would help because then you might avoid the fussy evening time, but then it might cause them to not sleep as long at night (if the above information about them not being able to sleep for an extended segment is true). Sorry this is so long! Thanks for your awesome blog. Wish I had found it sooner! I am not really sure. After that time period of feeding, I always changed Kaitlyn into her PJs and read her a story, so by the time she had eaten, changed, and read a story, it was really about a normal waketime length anyway for a young baby. So we have never really had “playtime” following that feeding, but there is some amount of waketime. oops!…I left out in my question that he is 4 1/2 months old…still on a 3 hour cycle (tho i am starting to try to get him on 3.5 hours)so I guess i’m just unclear as to When and also How to drop that 4th nap. thank you!!! One thing is that is a typically fussy time of day for babies. If you need to, you can try putting her down for her nap in a swing at that time of day.Also, she might not take a 2 hour nap. I know the schedule is hard for the baby who sleeps only one hour. It doesn’t really add up–I noticed that when Kaitlyn was a newborn :). Many babies take a shorter nap at that time of day, also. A 45 minute nap at that time of day is okay. Ok the evening is still terrible. When I try keeping her up longer, she gets really fussy and never ends up going to sleep. When I try putting her down earlier, she starts crying as soon as I lay her in the crib. I don’t want her to dread taking a nap, but I’m not sure what to do. She won’t sleep in the swing. She’s almost 5 weeks now. Also, the nap before this (normally around 2:30 or 3) she naps great. A full 2 hours or more. She often can’t handle a wake time during this time, so if I feed her at 2, she’ll often sleep until 5. I’m wondering if her earlier waketimes are too long and she’s making up for it during this nap. Its hard to tell what her waketimes should be because she still cries for a while before each nap since she’s still sleep training. Should I keep trying to tweak her schedule or wait until she is better at putting herself to sleep? It sounds like a typical fussy time of day. She should outgrow that before too long. You can also try adding some time to that waketime before that nap. hang in there! I have a question. My 12 week old is already on a 4 hour feeding schedule and has been since he was born, but what I am having trouble with are nap times. His feeding schedule is 1,12,4, and 8. So, I’m not sure how his naps should be since he is supposed to be on a 3 hour feeding schedule. What times would you suggest doing naps and for how long? Thanks in advance! Sorry, I meant his feeding times are 8,12,4,and 8. I am slightly confused! If an appropriate amount of wake time for a 4-5 month old is typically only 60-75 minutes, and their naps should be and hour and a half to two and a half hours, what do you do when there is left over time (i.e. they nap a shorter nap and end up waking up when it’s only been 3 hours)? More specifically, my daughter’s appropriate amount of awake time seems to be 80 minutes (she is almost 5 months). She then takes good naps – 1.5hrs to 3hrs if I’d let her – until evening time which is okay because I believe she is weaning from the 4th nap and she does sleep through the night.However, her schedule is currently varying daily because I’m having trouble knowing how to schedule her. If I let her nap as long as she wants, she’ll take a real long one and then want two really short ones which messes up her scheduling – meaning she’ll stay awake an hour and twenty minutes, get tired, only sleep an hour or so and then when she wakes up, I think just because she’s used to it, she wants to eat. Anyways, if I waited until the 4 hour mark for her to eat, it would be almost time for her to go down again, too and this all just creates a crazy schedule! Would you recommend just limiting her naps to 1.5 hrs until I can extend her wake time? Or should I do an adjusted schedule – like just be consistent with times but make one feeding 3hrs a part, and another 3.5, etc? I really want her schedule to get more consistent, I’m just not sure how to do it at this time. Any advice would be greatly appreciated! I have a question. My 12 week old is already on a 4 hour feeding schedule and has been since he was born, but what I am having trouble with are nap times. His feeding schedule is 8,12,4, and 8. So, I’m not sure how his naps should be since he is supposed to be on a 3 hour feeding schedule. What times would you suggest doing naps and for how long? Thanks in advance! I am wondering how to transition to the 3-4 month old routine. My 12 week old is on a 7-10-1-4-7-10 (dreamfeed) schedule right now, though it varies anywhere from 3-3.5 hours. His bedtime (8pm) is the only very consistent time where he goes to sleep without crying at all, then after the dreamfeed sleeps until about 7am (sometimes wakes early when he hears our alarm clock at 6:30).I’m worried about changing things since nights are going so well, but I know according to BW he’s ready for an extended schedule and/or dropping the dreamfeed. From your description above it sounds like we should get him to drop the DF first, then extend daytime feedings to about 3.5-4 hrs. Is this correct? If so, how soon after the DF gets dropped should we extend the daytime schedule? Also the way BW describes dropping the DF is confusing to me… what are your recommendations? This is basically the routine we’ve been following since birth so I’m nervous to change it! I am havign a very difficult time with naps and my son. He will take 3 ~45 min naps in the morning and early afternoon, 1 1.5-2hr nap mid afternoon and then totally skip his evening nap around 5. Doing the CIO thing and he will cry the entire length of the nap until his next feeding. He did this once and I couldn’t take it again, so now I put him down for his nap and let him cry 20-30 min and will get him because I can’t take it. Lately his naps have been even shorter. I have tried shortening waketime, lengthening wake time, and even decreasing stimulation and play to almost nothing, and still I am having problems. I read the CIO bootcamp blog and I was wondering how long you let them cry before getting them up. Any suggestions for better nap time? Intervention may be needed for me! I am losing my schedule (including feeding) due to nap/bedtime irreguarlities! (I think)My 14 wk old daughter started sleeping ~11 hrs/night about a week ago. Last night she slept nearly 12 hrs! At this time, she dropped from 6-7 feedings to 5-6. Her targeted schedule is 7-10-1-4-7. Now, her napping has become erratic, her feeding is off schedule (sometimes last feed at 5:30, sometimes at 6:30 or later) and I am left wondering if she is eating enough, I need to pump and if she is going to wake up at 5am again (which has happened a few times).I think she has already gone through her 3mos growth spurt, as at about 11/12 weeks, she went from 1 nighttime feeding back to 2-3, then back to 1 before she dropped it entirely.As far as I can tell, she is getting enough to eat with 5 feeds (poop, pee, disposition, etc). That said, I worry about it a lot. If she seems hungry and it hasn't been 2.5 hrs, then I'll feed her, but I try not to feed her at < 2 hrs very often. She has never shunned the breast when offered.History of napping:She is also a poor napper since about 8 wks…meaning, If I get 45-50min before she wakes up, then I am really happy, but typically it is exactly 30min. The only way I have been able to get her to sleep longer than that is to hold her and soothe her back to sleep, putting her back down when she is asleep. Sometimes she might sleep for 1.5 – 2 hrs after I get her back to sleep or if she had been in the carseat…but not often.History of bedtime sleep process:Up until this week, I had been nursing my daughter before bed and rocking her until she fell asleep. My husband was minimally involved in the bedtime routine, due to me trying to be practical with him working and needing sleep. Part of this was driven by her having reflux (so I needed to keep her upright for 20-30min after each feeding), but I must say that I wanted her to go to sleep without a lot of crying. Same deal for napping. I know this is not the BW/CIO way, but…that's what I have been doing.Recent bedtime situation:Sleeping ~11 hrs each night. Sometimes she wakes up after being asleep only 1 hr, but then goes back to bed until 5/6/7am.I realize the error of my ways–I haven't helped my daughter learn to soothe herself back to sleep, etc., and I would like to start sleep training using some version of CIO. My husband wants to help, but I decided he had to help get my daughter to be first before we tried CIO. Well…the first night my husband put her to bed, she cried for 50min, then 20min, then 10, then 5. He put her in her crib awake and then sat by the crib and patted her until she fell asleep.Recent napping situation:I have also started to put her down for naps w/o being asleep…and she can put herself to sleep, but then she started to wake up after 20min…yes, 20min. If it is close to 2-3 hrs since her last feed, I feed her. But, sometimes it is not, and now I can't get her back to sleep. I am willing to do CIO, but I don't want to have nighttime CIO crying and daytime CIO crying at the same time–I am not sure I could handle that many potential hours of crying.How do I re-gain control? I a new to the blog and have been reading a lot of the posts, but I feel like I have so many issues going on, I don't know where to start?Short napper?CIO for naps?CIO for bedtime?Early wake times?My husband is very supportive and thinks I am stressing too much…he's probably right?Help! Ethan’s mom,I am sorry I missed your comment until now. Please let me know if you are still having trouble. Thanks for the reply.I am not sure if I mentioned this, but Ella has been on 5-6 feedings/day for about 2 weeks when she started sleeping 10-12 hrs/night straight through…she just naturally dropped her 7th night feeding when she started sleeping 10-12 hrs. I haven’t been pumping, and I have been worried about supply (I am a chronic worrier)…but until the last 2 nights, she didn’t seem to be protesting (crying or getting up in the middle of the night). I didn’t pump, because I kept thinking she would wake up to eat again! She didn’t for 10 nights! However, the last 2 nights, she got up at 1:30am (Sun) and then 9:15pm (Mon), so maybe she is getting hungry and I should add the dreamfeed. I *do* hate to wake her up, when she was SSTN for 10-12 without ever having a dreamfeed.For the past 4 days, I have been putting Ella down for her naps while awake, and she goes to sleep after about 5-15min w/minimal whimpering. However, at exactly 30min she continues to wake up crying. Today, she only whimpered at her morning nap, so I left her and after 40min, she slept for another 30min! But, then she wailed for the next 2 (after 30min). I was out, and my husband got her up after the 2nd nap, but for the 3rd, I let her cry for 10-15min, then sat with her until she fell asleep (awake again for 40min) for another 25-30min. Not true CIO, but I am trying! We are trying to do the same for bedtime (putting down awake), but she is often so tired, that after nursing her, even with jostling and putitng in a swaddle…she is OUT! OR, she wails just b/c my husband is rocking her (as part of the bedtime routine) and not me. I have resigned to the fact that my son hates to nap. I am still haveing troubles, but I am dealing with it since I read your blog on naps. He wakes up pleasant, so I figure he is fine with the amount of sleep he is getting. My other question is he just turned 10 wks old and still istn’t sleeping through the night. He wakes up usually around 12 and 3 in the morning, but every night is a little different. He has slept 8.5 hrs, but that was only once. We started babywise a little late, would this make a difference? Should I give him a little longer or let him CIO for one of the nighttime feedings? I put him down to sleep at 7 and let him awake on his own. I tried the dreamfeed, but he didn’t respond well to it. My 10 week old is on a 3-3.5 hour schedule and it has been working great for us. She STTN after her 10:45 DF until 7:15-7:30. The problem is that I am having to wake her from every nap to eat. She is getting 1.5 – 2 hr naps. I am not sure if I should give her more time between feedings so I am not always waking her. I am also not sure that she is ready for a 4 hr. schedule. I know you say to drop the DF before the 4 hr schedule. Also, with her first feeding at 7:30, how can I fit in enough feedings with a 3.5-4 hr schedule and still keep her “bed time” around 8:00-8:30? CE, I suggested the pumping because BW says to maintain supply to not go longer than 9-10 hours between feedings if you are BFing up to I think 16 weeks? She is close to a growth spurt age, so if she needs more food, that wouldn’t be uncommon. That might explain the early naps and the night wakings. Ethan’s Mom,Starting BW late does make a difference in when they reach those BW milestones.I don’t ever consider forcing a feeding to be dropped until 12 weeks. The book says a certain percentage don’t sleep through the night until that age, so I wait until then to consider it. Since you don’t do a DF, he will likely need one of those night feedings longer than those who do DF need a night feeding. That is normal and fine, just be aware of what to expect.I would give him to 12 weeks and then evaluate the situation. Thanks for your help. We have been doing the eat/wake/sleep cycle since birth and it is going great. Since posting I have dropped the DF and she did perfect still STTN. We have also gone to a 3-3.5 hour schedule that also seems to be going good so for now I am not going to push the 4 hour. Will probably wait at least until I introduce solids. Thanks for your help. Hi! I have a calculation question for you! For 3-8 weeks (our son will be 7wks tomorrow), when BW suggests being able to go down to 7 feedings in a 24 hour period –but only if he starts sleeping 7-8 hrs a night, WHEN do you start counting the 7-8 hrs from? In the proposed schedule would it begin from the 7pm feeding because 10pm & 1/3am are dreamfeeds and therefore still sleeping? In which case in the example, you would be able to go down to 7 feedings?We currently have 6 feedings (6:30am, 9:30, 12:00, 2:30, 5:00, 7:00) then our 10pm and 1/3am and 4/5am feedings (9 total), does this mean our son could go down to 7 feedings total, because he "sleeps" from 7pm until 1-3am?Of course he is still waking up on a 2 hour schedule because of a recent growth spurt, but as he begins to sleep longer, do you think we are ready to try for fewer feedings (ie 7) with longer stretches? Not sure what I am doing differently then everyone else. My son will be 14 weeks tomorrow and is still not sleeping through the night. He awakes early from all of his naps that are only lasting 30-45min. I have him on a 3 hour schedule (7,10,1,4)doing the eat/wake/sleep cycle. Wake times vary, however he cont to only nap a short period of time no matter how long or short nap times are. He has begun to get fussy at the breast. Not sure what I am doing wrong. Ethan’s mom,Sorry I can’t be of help with the STTN part, my 5 1/2 mo has been STTN just as BW says. But he too was starting to get fussy at the breast, probably started around 3 mos I think. It got progressively worse and I was getting no help from lactation consultants, nurses, or his dr. because he was still gaining weight really well. I was getting so frustrated though because he would eat for a few mins, then get really fussy and refuse to eat more. I finally came to the conclusion that BF was not the happy bonding time it should be. So I started pumping and bottle feeding him breast milk. I still BF for the first feeding every day… for some reason he does well with that one, and I sometimes BF if I’m somewhere where it’s easier to BF than pump (traveling across state to visit my fam for instance). It’s been going really well and since he doesn’t BF all the time anymore, it’s almost like he views it as a treat when he gets it now. Good luck, I know how frustrating that is! You are welcome Shalee. That link I posted isn’t just to do the EWS cycle, but thoughts from Anne Marie Ezzo (wife to Gary Ezzo) about waiting after baby wakes up a certain length of time before feeding. It sounds like things are working well for you. Devines,7-8 hours means 7-8 hours without a feeding at all. Even though he is still sleepy or asleep at the 10 and 3 feedings, it is a feeding. We are talking 7-8 hours between feedings.The first feeding you want to drop when you do is that 3 AM feeding. Good luck! Ethans Mom,As far as STTN, you really aren’t alone in that. Many babies are not STTN at that age. For help on that, see the posts on nightime sleep. Short naps are also common, so you aren’t alone there. See the blog lable “45 minute intruder” for help there.There are some possiblities for the breastfeeding. Most babies get significantly faster at nursing around 3 months old. Many moms try to force their child to eat as long as “usual,” but it is unnecessary. They are just more efficient. If he starts off eating well, but finishes early, then it might be that.If he starts off fussy, you might not be having a fast enough let-down for him. He might be more aware of his surroundings and more interested in what is going on than eating.Be sure to look into supply and what you are eating as possible problems. See the blog lable “nursing” for more ideas on the topic. Thanks for your thoughts jencwu! Thanks for the nursing tips jencwu! We are still dealing with short naps and he still wakes up 1-2 times per night. He is 16 weeks old and I feel like I have failed him. He is now taking all naps in his swing because he will cry the entire length of his nap in his crib. I figure at least in his swing he is getting some sleep. Plus,I have returned to work and it is just easier for my parents to put him in the swing. I am at a loss as to what to do. He sleeps fine in his crib at night, but that is about it, naps are still a fight. Any suggestions, or is this just something I have to deal with and hope he grows out of? Also, the few times he has slept 8-9 hours at night I have awoken because my breasts are so engorged. I have not pumped for for fear he will awake and want to eat as I am pumping. When he begins to sleep consistently through the night am I to pump in the middle of the night to relieve my breasts or will they adjust? Also, when my breast get engorged I have a reduction in milk supply for a few days after, so I try not to let this happen. My son has also been dealing with constipation, so I have not been able to start him on solids yet. Any help would be great! I LOVE YOU BLOG! Thanks for all your practical insight…your blog has been my “go to” on several occasions!My baby boy is 15.5 weeks old. He has been STTN with an 11:00 dreamfeed since he was 11 weeks old. I’m thinking that we are ready to try transitioning to a 4 hour schedule and dropping the dreamfeed. My first question is which would you suggest changing first–dropping the dreamfeed or the 4 hour schedule during the day? My second question is do you gradually move to a 4 hour schedule by doing a 3 1/2 schedule for a week or so first or do you try to just start extending it to 4 hours? Ethan’s mom,I would rule out possible reasons for the nap problems, including medical reasons like reflux.He might be having a hard time adjusting to you going back to work.Once you know he is 100% fine and is just not going to sleep for naps, I recommend CIO if possible. Remember that things you start now will not go away in the future and around 5-7 months he will outgrow the swing.Your breasts will adjust as he continuously sleeps through the night. It should only take a few days. Since you need to avoid engorgement, you can pump to relieve pressure, but don’t pump so much that your body doesn’t make the proper adjustment to milk supply. NicoleFiehler, thanks! I am glad to be of service.Drop the dreamfeed first.As far as 4 hour schedule goes, it can be done in a variety of ways. See the blog label “four hour schedule” for much information on this topic. I have a four week old (born 5 weeks early). We are on a three hour schedule 7am, 10, 1pm, 4, 7 (bedtime), 10 (DF), and two night feedings. We are letting her sleep at night and waking up naturally for a feeding (no longer than 5 hours though). Last night she woke up after four hours at 2am and 3.5 hours at 5:30. She fell asleep at 6:30am. Our start time is 7am. Should I wake her up at 7am or let her sleep a little longer, sometime inbetween 7 and 10?Also she seems to have days and nights confused. Any suggestions? Kelly-This is what I did. If my son woke up 30 minutes or less before our normal wake time I’d make this our wake time. If he woke up say an hour before our normal wake time I’d make 30 minutes after our normal wake time his wake time. So if the normal wake time is 7 am, then if he WAKES at 6:30 or later this is his wake time for that day. If he wakes like at 6:00 then I’d make 7:30 his wake time for the day. I did it like this to spread out the eating times a bit and to ensure he got a little bit of sleep in between since a baby that young will not be able to function well at all with no sleep. I hope that made sense. It also made it a lot easier for me to have a strict rule to follow since I had a half way functioning brain in the middle of the night and early in the morning. I’m not sure if I am on the right schedule for my 11wk old. We are currently doing 6am/9am/12pm/3pm/6pm/9pm then bed with 1-2 night feedings. I was doing 8:30pm/10:30pm instead of the 9pm but was having such a hard time waking her at 10:30 my friend suggested I go down to just 9pm. She slept 7.5 hours once at 6wks old but hasn’t done it again since. She is currently getting me up once sometimes twice at night, with her 8:30/10:30 she usually only woke me up once. I am so discouraged since my friends babies are already sleeping 7-8hrs at night and they are a month younger than her. They all kept telling me she should be doing 9-10 hours by now. I’m not sure if I have messed up her nighttime sleep because I switched her around and if I should go back to 8:30/10:30pm or if 9pm is ok. She just didn’t want to really wake up for the 10:30 feeding. She takes naps during the day and usually stays awake 1-1.5 hours then goes down. She does have reflux so I try to minimize how much she crys during these times. For naps she usually fusses about 5-10 minutes but at bedtime can fuss for up to a hour. I’m not sure what I should be doing for her. Have I completly ruined any chance of her sleeping 7-8hrs or worse 9-10hrs because I switched her around? Should I go back to her old schedule and try to wake her up at 10:30pm? Any help with this would be greatly appreciated. If she needs the feedings, cutting back from 8:30/10:30 to just 9:00 will keep night feedings around longer. If she slept better with that, I would go back to it.Also, keep in mind that reflux plays a HUGE role in sleep. Kaitlyn was an awesome sleeper, but still didn’t STTN until she was 3 months old. Now that I have McKenna who is also an awesome sleeper, I can see what a difference that reflux made for Kaitlyn.You have never completely ruined anything. You can cause more work for yourself, but you can’t ruin it.Another thing, it is completely in the realm of expectations for some BW babies to not STTN until 12 weeks. When you add reflux to the mix, it makes it even harder. Check out the blog label “reflux” for more. My baby boy is 6 weeks (almost 7 weeks). We are trying to implement BW, but naps are a struggle. Sometimes he goes down great without any help, other times it will take an hour to get him down. (He will cry, we will try to soothe him, and the cycle repeats.) We try to let him cry until it is obvious he is not going to settle himself. His awaketimes are long and he stays happy, so his naps rarely exceed an hour and can sometimes only be 30 min. My goal is for him to eventually wake at 8 and go down around 8 or 9 for the night. Right now, I am feeding on a 2 1/2 – 3 hour schedule. Many mornings he wakes between 7:30 and 8 and his last feeding at night is usually between 11 and 11:30. He will sleep until about 4 and that is the only time I feed him at night. It is great to only have one night time feeding. However, my question is with the time between when I feed him at 8:30 or 9 and then at 11. We have been keeping him up for a little while and then trying to get him to nap. He doesn’t go down easy and sometimes doesn’t nap at all. We are stuck on what to do during this time. Should we put him right to sleep after feeding at 9 and wake him for a feeding at 11:30? If so, do you think he will sleep until 4 or should we prepare to adjust our night time schedule? I am a first time mom and feeling really overwhelmed. We are trying to not overstimulate him, but he stays alert and happy for usually 30 min after he eats. Any advice would be great!! Thank you! I have a 10 week old baby and am confused about the scheduling. She has been doing the three hour schedule starting at 7am. She should be sleeping 7-8 hours (which sometimes happens) but I don’t see how that is possible on a three hour schedule and 7 feedings in 24 hours. (Babywise says to not have fewer than 7 feedings until Baby is sleeping 7-8 hours at night.) The 3-hour schedule ends up being 1:00 in the morning (as the seventh feeding), getting up at 7:00am, which is only 6 hours inbetween feedings. Does this mean that my baby needs to be on a 2.5 hour schedule to get in seven feedings which will allow her to sleep 7-8 hour? Please advise. Thanks! Kelly,Many people feed sooner than 3 hours when needed to get the feedings in. But you don’t have to. With 6 feedings in the day, and one at night, you would have:71014710then a feeding in the night makes 7. Baby can go down to 6 feedings once that night feeding is dropped. Thank you for answering my question. Would you fit in seven feedings during the day instead of having a night feeding? If so, what would the schedule look like for you?Also, my baby was really fussy today (gas or constipation) and was off schedule so much that her last feeding was at 8:30 (usually 10pm). After the 10pm feeding she usually sleeps until 7am. She had the normal amount of ounces today (bottle-feeding) for the normal six feedings during the day. I am thinking of feeding her at 10:30 so that she sleeps until 7am instead of waking up early. I imagine she would be very awake and want to play after sleeping a long stretch. What would you do for this situation? Thank you for this blog. It is wonderful! I really appreciate your time and effort to post entries as well as answer questions. I know that you are busy with a newborn now. So whenever you get a chance to answer my questions, I will appreciate it! Hi. I have another question and whenever you get to it, I appreciate your time. My baby (14 weeks) still cries when I put her down for a nap during the day. It is her normal nap cry – nothing unusual, last less than 5 minutes and ends with sighing or talking or a yawn. Is this normal? Do babies ever stop crying when put down for a nap? Thanks. KellyI think they probably all eventually stop crying, but some will take quite a while before they stop (several more weeks than 14 weeks). It depends on the baby I think. It probably depends on if mom is doing something to reinforce the crying too…not saying that you are but think about what you are doing to make sure you aren’t. I’ve just begun scheduling my almost 2 month old son. I seriously just started today. And honestly, he’s done beautiful with minimal crying. However, I’ve got him on a 3 hour schedule, beginning at 8am and bed time is at 9am. His nap lengths are 2 hours. I was wondering if that is too long? It took him 30 minutes (of crying) to go to bed. Before we didn’t have a set bedtime and it was whenever he fell asleep nursing. He usually sleeps 3-4 hours at a time at night. Should I keep at the 3 hour schedule and see how it goes for a couple of day or would you recommend bumping him down to a 2.5 hour schedule with 1.5 hour naps? His play time only lasts about 15 minutes, and then he starts getting tired (I think, his sleep cues and feed cues have DISAPPEARED!). Kelly,To get 7 feedings in the day, you would cluster feed in the evening. 7101468then Dreamfeed anywhere from 10-11In the case of her feeding being at 8:30, I would have fed her again at 10:30. Kelly,Most do stop crying, but some cry a bit for a long time. My good friend (Kelli 🙂 ) has a son who cried for about 5 minutes before every nap until he was about a year old. Jessi, two hour naps are definitely not too long. I would stick with three hours if that works for him. Hi there, I have a question about my 3 week old. I am having alot of problems getting her to sleep, whether it is at night of during the day. She doesn't want to go to bed on me, or by herself. She will is starting to stay up the whole time between feedings (2-3 hours!) I don't know what to do. I have tried swaddling her, but it makes her made. I have tried letting her cry it out, but that doesn't work. I have tried rocking her to see if I can encourage sleep and nothing. Please help me. Firecracker,Have you see the post "waking early from naps/won't fall asleep for naps"? that has all of my ideas for that situation. Ok, my baby is 9 weeks old. According to your suggestions for that age (using the max amount of wake time, 1.5hrs, on a 3.5hr schedule), baby is sleeping 17hrs a day? Did I do the math right?Most of the info I've read says babies this age should be getting 15-16 hours of sleep a day and my son is averaging 14-15. He is happy and healthy, so I don't think I need to make him sleep more. In fact, when I try to get him to nap more during the day (2 hour naps on a 3.5 hour schedule), he wakes up more during the night. I was just curious what you might think about my situation. I want to make this babywise stuff work, but I don't want to force my baby into a schedule that doesn't work for his specific needs. Should I keep trying to get him to sleep on schedule, or modify the daytime schedule so he has more waketime? Karamia,The thing to remember with averages is that they get that number from lots of other numbers. The "average" is really a number that few babies are at. The average is reached by taking several numbers, adding them together, dividing them by the number of numbers, and there is your average. So if you had one baby at 15 hours, one baby at 18 hours, one baby at 12, and one at 17, the average would be 15.5. Only one of those babies is actually close to "average. "BW is all about doing what works for your baby. It would be impossible for them to list every scenario encountered by every baby in one book. My blog is thousands upon thousands of pages, and I haven't even come close to covering everything just with my three children. 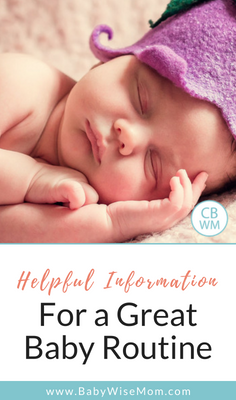 The book gives guidelines and generalities, and then you have to take those and apply them to your individual child.If you are interested, you can see what the majority of babies are sleeping at different ages by looking at the "sleep totals" blog label. But do be sure to realize that there is a majority, but also many other numbers that are working for people. Thanks, I appreciate your feedback. We are getting the hang of things over here (slowly, but surely). Thanks for sharing that nicnac! My guess is that you need to figure out waketime length. I don't think you have had it right in the past; 1 hr 45 min is definitely too long for a 6 week old. So I would suggest you see the blog label "optimal waketime" for help in figuring that out. He also might be ready to drop the swaddle now. See "swaddling" for more on that.I would first focus on the waketime length. Once you have that figured out, you can move on to other things. Hi! My daughter is almost 10 wks old. She eats every 3 hrs: 6, 9,12,3,6,9 then bed. She started SSTN at 7 wks and did it continuously for about 8 days. For the past week though though she has SSTN every other night and the other nights woken at 4-4:30 therefore I end up nursing her around 4:30 those mornings. When her usual wake time is 6, after going down at 5:30 I have a hard time wanting to wake her at 6 or even 6:30 though I know I should be consistent. What should I do and by do you think she has started waking earlier?? Harts, it could be a growth spurt. As for what to do, see the post "Early morning feedings before waketime"
Ok, so I have a question. Our newest baby is 6 weeks old. She has been an angel and has been eating and sleeping great since the beginning. The thing is, she started sleeping 6-7 hrs at night when she was 4 weeks old. I would sometimes wake her up, but have decided to let her sleep. She eats every 3 hrs during the day, sometimes 3.5 hrs' and I can tell she does fine with that and is ready to consistently eat every 3.5 hrs. But i read on this post that she shouldn't be sleeping that long yet and that she should be getting 7-8 feedings in a day. Right now she only eats 6 times if she doesnt wake at night. She is gaining weight beautifully, an ounce a day so far. Is what im doing ok? This is our second child and we did baby wise with our first,,,,she didnt sstn until she was 11 weeks old, so this was never an issue!I'd appreciate your input, thanks! I will be switching my 3-month-old to five feedings and three naps soon and I was just wondering what you would recommend for the schedule. I was thinking feedings at 7:30, 11:00, 2:30, 6:00 and 9:30 but I'm not entirely sure where to put the three naps in… Thank you. Hey everyone!! I have an almost 10 week old who's been STTN for a week now!!! (yay) I know it's not time to stretch the daytime feelings just yet but BW says to start bw 12-15 weeks going to a 3.5/4 hr schedule. My question is Bw also suggests to drop a dreamfeed (which we've never really done) and the late evening feed during this time as well. Anyone just been through this phase or have any advice to offer??? Our current schedule looks like this:6:30 (wake and eat)7:30-8 nap9:30 eat and WT10:30-11 nap12:30 eat and WT1:30-2 nap3:30 eat and WT4:30-5 catnap6:30 eat and WTCatnap 30% of the time but normally stretches to the next feeding then goes to bed8:30 (bed, no wake time) So, do you see anything wrong with this? Would I try to stretch the feelings and then drop the late evening (8:30) or adjust 4:30-6:30-8:30??? Or do I drop th late evening (8:30) and then stretch?? Any advice is greatly appreciated!! My Baby Is Now 14 Weeks Old. I've Been Doing BabyWise Since He Was Two Weeks Old. I Put Him Down For His Naps 45/50 Min After Waketime. He Has Always Fallen Asleep Fairly Well. Minimal Crying. I Also Had To Wake Him To Eat After Most Naps. He Has Been Taking Shorter Naps This Week…And I'm Not Sure Why? He Also Doesn't Sleep Through The Night Yet. He Usually Only Wakes Up Once Each Night. Because He Hasn't Been Napping As Long…I Have To put Him To Bed A Little Earlier. Is That What You Would Do Or Would You Keep Him Up Just To Say He's Going To Bed At "Regular Bedtime"?By The Way I Am So Thankful For This Bog!! Hi Michelle, thanks 🙂 I would try keeping him up about 5 minutes longer and see if that helps his naps. If not, it might just be wonder week related. Bedtime is usually in the 7 pm hour, so I would anytime in that hour and call it bedtime. If he wakes in the 8 am hour, have it at 8 pm. I have a three month old who was sleeping great before Christmas and New Years but with family holding her nap time was Affected. Now she wakes 45 min -1 hr into naps and won’t go back down. She wakes happy so we just leave her and feed Around the three hour mark. She’s doing five naps per day and six feedings the last between 830-9 pm and wakes at six am. How do I get her back on the eat wake sleep cycle ? Really, there isn’t much you can do beyond wait for her to sleep through again. Does she go down initially on her own? If she is self-soothing to start her nap, you are doing all you can do. Leaving her until feeding time is perfect. If she isn’t falling asleep independently, then I would work on that. And of course, do be sure she isn’t waking up from a growth spurt or some sort of sickness. Thank you! She is self soothing to sleep for her nap but just wakes up early . Not fussing usually just hanging out so we’ll just keep her there for quiet time and hope she gets back into her rhythm. Appreciate the advice!